Heavy-duty 2-1/4 inch tall rigid leg leveler with thick nylon base. Preferred by many to original metal levelers. 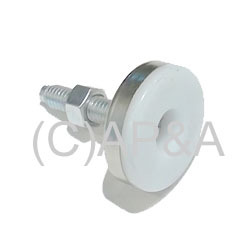 Thick white nylon base helps protect flooring surfaces and makes game moving/sliding easier. And the nylon base will not rust, further protecting your floor from stains and damage. Replace those rusted, damaged, or missing leg levelers with these brand new heavy-duty units! These levelers have 3/8 x 16 threads (same as standard pinball leg bolts). Threaded portion of leveler is 1-1/4 inches in length. Overall height of leveler is 2-1/4 inches from bottom to top. Diameter (footprint) is 1-11/16 inches. Individual levelers will support 250+ pounds weight. Includes locking nut.